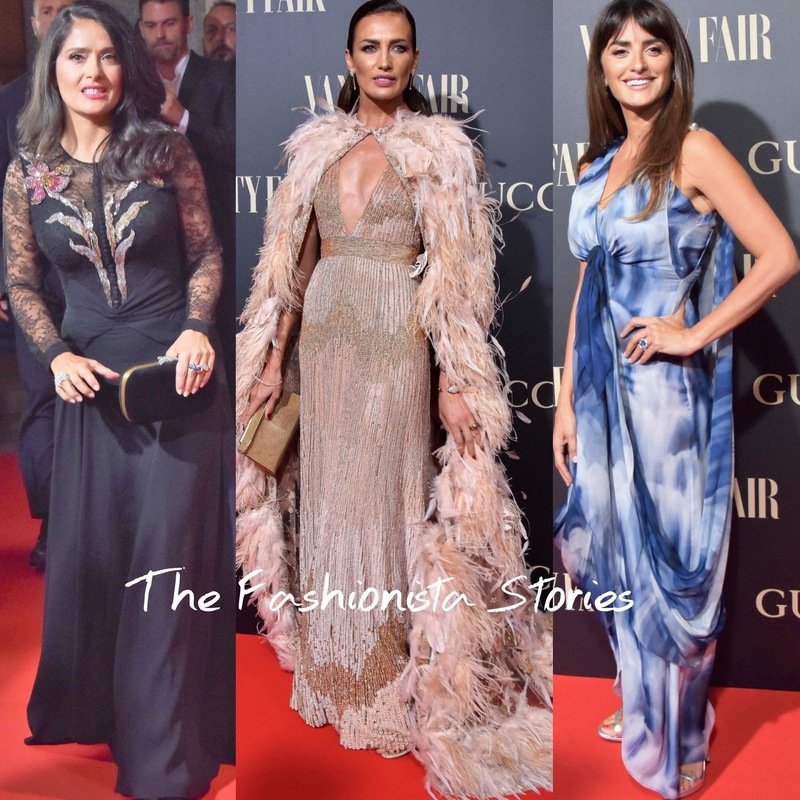 Salma Hayek, Nieves Alvarez and Penelope Cruz attended the 2018 Vanity Fair 'Personality of the Year' Awards at the Royal Theatre on Wednesday(September 26th) in Madrid, Spain. Salma Hayek wore a GUCCI black gown which featured a see-through long lace sleeves, a sequin floral bodice and a twist detail waist. Without the sequin floral panel, this would have been a plain black gown. Nieves Alvarez was perhaps my favorite wearing this ELIE SAAB FALL 2017 COUTURE blush feather cape and beaded gown. It maybe something that we have seen from Saab but the impact and the drama that she is serving, makes this a win for me. Penelope Cruz wore a CHANEL SPRING 2018 blue & white tie dye, draped silk-chiffon dress, featuring a v-neckline and a back split. On the runway, the neckline was adorned with an embellished brooch which I wish she kept.